Ich liebe es, die "Tagebücher" meiner Mitreiter zu lesen, und wenn sie es möchten, veröffentliche ich sie auch gerne hier. // I love reading my riders' "diaries", and if they are happy with it I'm also amenable to publishing them here. // J'adore lire les journeaux de mes cavaliers, et s'ils le veulent, je les publis aussi ici. A circular ride full of points of interest and strongly recommended! Alice is an excellent guide with a lot of knowledge of local history and folklore. She speaks fluent English, German, French and the local dialect. She led us through the forest very competently, taking charge in a relaxed, friendly way. Her horses were well-trained, fit and willing partners. A well-organised and well-thought out tour. I will certainly come again! The weather stayed sunny and warm and the autumnal colours in the forest and across the hills were spectacular. 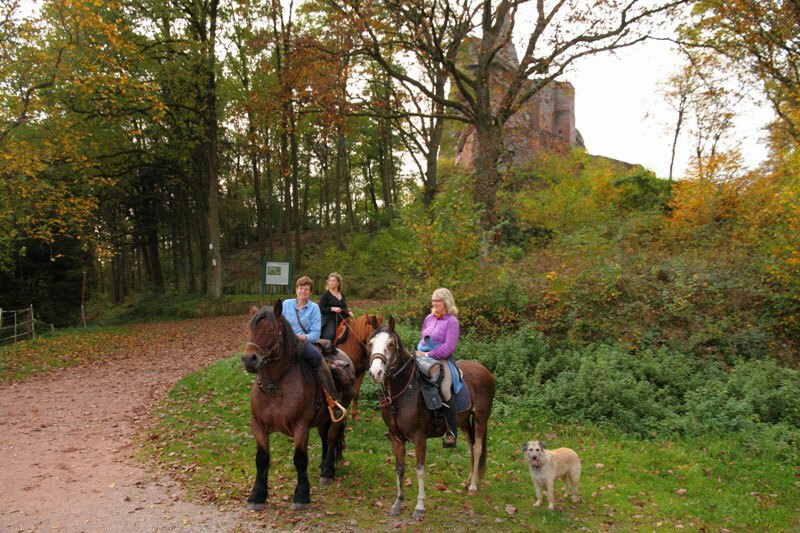 Three women, three horses and my dog set off late morning from Alice's home in Lampertsloch. An international bunch - Alice is Scottish but married to a local Frenchman, I'm English but live in Germany and Toni is Polish and also lives in Germany. Conversation was relaxed and easy. After an hour's riding along gently sloping forest trails, past evidence of the Maginot Line, we reached a bunker and a WW2 tank. There followed a climb up to orchards and pastures above the forest leading to a fantastic panoramic view with the village of Lembach as the centre piece. Here we stopped for a picnic lunch and a break for the horses before riding through the town of Lembach with its picturesque timber-framed houses. Having got special permission first, we rode on through a large private forest on a sandy trail past the two remaining houses of a charcoal burners' village with Alice providing snippets of history. We rode on through the pretty village of Niedersteinbach and arrived in Obersteinbach in time to catch the wonderful light of the setting sun over a castle ruin on the hillside above our hotel. The hotel was extremely comfortable and we were given a warm welcome. After an excellent French dinner, good wine and wonderful company, we slept soundly. After a leisurely breakfast, we continued our tour riding higher through the forested hills and stopping at bizarre rock formations and castle ruins, The ruin of Blumenstein was particularly impressive and the views from the tower simply stunning. For lunch we had a local potato, cream cheese and bacon speciality while sunning ourselves on the terrace of a French restaurant in the small isolated village of Wengelsbach. After crossing the border into Germany, we rode past the ruins of Wegelnsburg and on to our overnight stop in Bundenthal. Here we had a great evening with Alice's friends eating freshly picked mushrooms and pasta in a nice family hotel. Again we took our time over breakfast and getting the horses ready. We rode to Hirschtal where we were joined by Dana, a German friend of Alice. The next section with views of the famous Fleckenstein Castle perched high above us was magical. Carrying on up to the castle and then to our lunch stop, Gimbelhof, a farm restaurant where again we were able to sit outside. Now feeling a bit tired, the afternoon ride seemed long but also had its highlights, a pretty stream and ponds, more Alsace typical villages and a steep climb up over Col du Pfaffenschlick and down to Lampertsloch, arriving just as dusk was falling. Thank you Alice and your horses for an unforgettable few days!